Brother Paul saw me off, repeating his assurance that it had been an honour. On the road in the bright sunshine, I found myself envying him. But precisely what was it that I was envying? The warmth of the cocoon that surrounded him? His certainty? The joy that peeped out again as we shook hands? His faith itself? To some extent, of course, all of these, but there was something else: his courage. The truth is that I am unable to believe that when Christ said: 'My Kingdom is not of this world' he meant that it was. Among the fifty monks of Notre Dame d'Aiguebelle, it was possible to see, misty but unmistakeable, the point. The enclosing shell of the monastery becomes a symbol of what must be the ultimate truth not only of Christianity but of all religions: the Kingdom of Heaven is within. For the monks within the walls, for the rest of us, within the human heart, which has room enough for all the walls there are. We all carry within our hearts a Notre Dame d'Aiguebelle, where we can find, though only if we seek diligently enough, the things of the spirit that alone make sense of the things of the world. Brother Paul seeks diligently enough; I don't. But the reason I don't can only be that I fear to find what I am seeking. That is why I said that what I envied him was, in the end, his courage. The incomparable Bernard Levin reflects on his stay in the Trappist monastery of Notre Dame d'Aiguebelle in his book Hannibal's Footsteps. I took the header photo at the monastery of Chartreuse du Val-de-Bénédiction in Villeneuve les Avignons, which Bernard Levin passed on the walk he describes in Hannibal's Footsteps. 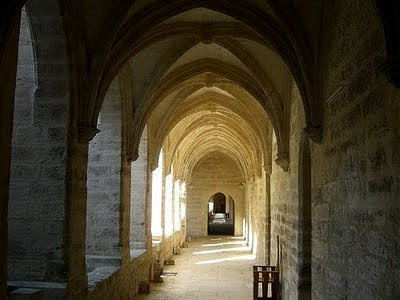 The old monastery in Villeneuve les Avignons is now a performing arts centre and has hosted Pierre Boulez and the Ensemble InterContemporain among others. Read more in Happy new ears in an ancient monastery. Bernard Levin's love of the English language, and above all its correct usage, died with him: to be replaced by text messages, Twitter and blogs. Bernard Levin wrote sublime prose, but he was also opinionated and controversial. How many critics have you wanted to do this to? The obverse of conflict can be found in Bernard Levin's TV interview with Krishnamurti, which reminds us that in times past BBC TV and other networks did not worship solely at the altar of entertainment. Shakespeare, Mozart, Schubert and Wagner were his gods, and he wrote passionately and eloquently of them. But his writing could surprise as well as affirm. I am on the road myself for a while, and below are quotes from a column by Bernard Levin in the Times from the 1980s. Those last minutes are as profoundly affecting as anything I have ever seen in the cinema, a theatre or even an opera-house, and I shall return to them in a moment. But long before they are reached, the audience has been pierced by the effect of this ravishing masterpiece and the poetic imagination that informs it throughout ... But then, in that sense to be a child is the noblest ambition to which we can apire ... Whether we take it or not is up to us. What is the work Bernard Levin is writing about? I will reveal the answer when I return, unless someone posts it elsewhere first! Incidentally, you won't find the answer by Googling. dear pliable, thanks for the links. this was the first time i have heard krishnamurti. i was wondering whether you actually agree with what he says: that religon and rituals are "based" on thought and all that stuff about distortion? hmm, dunno, thought it was a bit silly to be honest. Billoo, thanks for that and for the link to your own interesting blog. Interestingly, it was not just 20th century ‘fringe’ composers who were connected with Theosophy. In 1892 none other than Sibelius and his wife Aino stayed with the dramatist Minna Canth who was deeply interested in both Buddhism and Theosophy. And Scriabin was deeply influenced by Theosophy. I’m also aware that verbal explanations of religions, except perhaps the ones we were brought up with, can sound ‘silly’. As can verbal explanations of contemporary music. But you raise an interesting question and I need to answer it. No, I do not believe in the concepts that Krishnamurti was extolling in that interview. But I do not see that as a reason for rejecting them. TWD, no not Tarkovsky's Ivan's Childhood. But, as ever, a perceptive response. I'm off on my travels shortly, despite an outside temperature that is currently -3.5 degrees C! Keep the comments coming. But there will be a delay in moderation as monasteries don't have Wi-Fi! ET springs to mind - would Bernard Levin have gone to see it? What happened to Lance Perceval? Is it "Close Encounters of the Third Kind"? Kind words...Is it Hope and Glory? Benard Levin was one of my favourite columnists when I was a student in the eighties. I remember one piece in particular when he described how he had come to a time in his life when he no longer felt the need to see 'Carmen' or 'Tosca' ever again, while his love for Mozart was inexhaustible. The other critic I much admired was William Mann, who seems to have been forgotten now. Could the quote be about Tarkovsky's 'The Sacrifice'? Thanks pliable for your-as ever-informative comments. And yes, you're right, we often see other viewpoints other than our own as odd or silly. But I don't know, one can surely still feel a genuine wonder towards some perspectives that are not our own whilst others can seem-and it may only be a question of seeming-not just odd, but wrong and/or silly? Personally, I find it hard to take someone who talks about Buddhism, Christianity, and Islam as being based on thought-or who thinks of revelation as just (distorted) words- very seriously. On her deathbed, Gertrude Stein was approached by a great friend and confidant, who asked her, "Well Gertrude, now for the answer". "No!" said Gertrude, and with her last breath said "Now for the question." Pli, I sincerely hope you're not on your deathbed! 7 X 6, wasn't it?